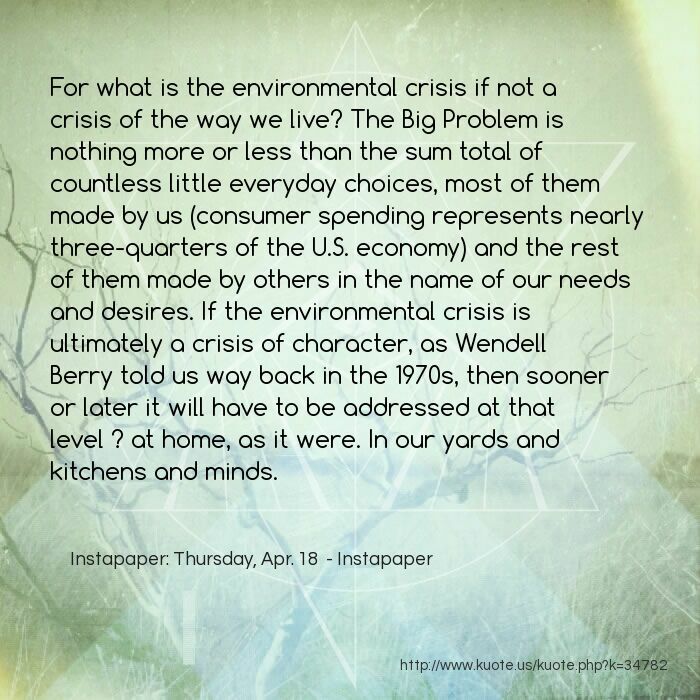 For what is the environmental crisis if not a crisis of the way we live? The Big Problem is nothing more or less than the sum total of countless little everyday choices, most of them made by us (consumer spending represents nearly three-quarters of the U.S. economy) and the rest of them made by others in the name of our needs and desires. If the environmental crisis is ultimately a crisis of character, as Wendell Berry told us way back in the 1970s, then sooner or later it will have to be addressed at that level ? at home, as it were. In our yards and kitchens and minds. One problem with the division of labor in our complex economy is how it obscures the lines of connection, and therefore of responsibility, between our everyday acts and their real-world consequences. 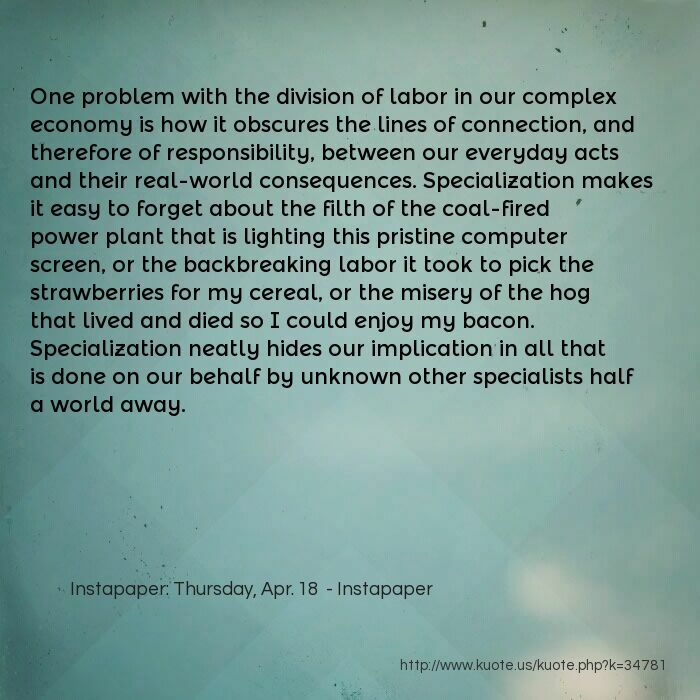 Specialization makes it easy to forget about the filth of the coal-fired power plant that is lighting this pristine computer screen, or the backbreaking labor it took to pick the strawberries for my cereal, or the misery of the hog that lived and died so I could enjoy my bacon. Specialization neatly hides our implication in all that is done on our behalf by unknown other specialists half a world away. Virtually all our needs and desires we delegate to specialists of one kind or another ? 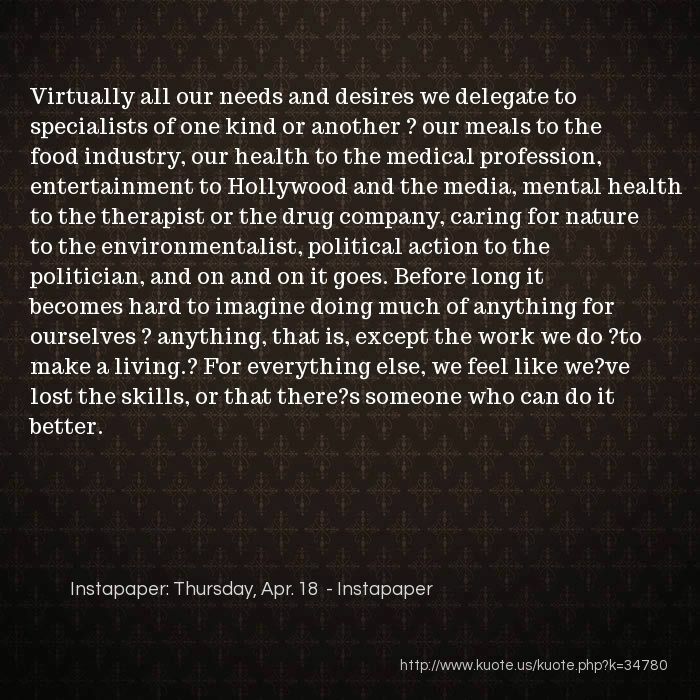 our meals to the food industry, our health to the medical profession, entertainment to Hollywood and the media, mental health to the therapist or the drug company, caring for nature to the environmentalist, political action to the politician, and on and on it goes. Before long it becomes hard to imagine doing much of anything for ourselves ? anything, that is, except the work we do ?to make a living.? For everything else, we feel like we?ve lost the skills, or that there?s someone who can do it better. 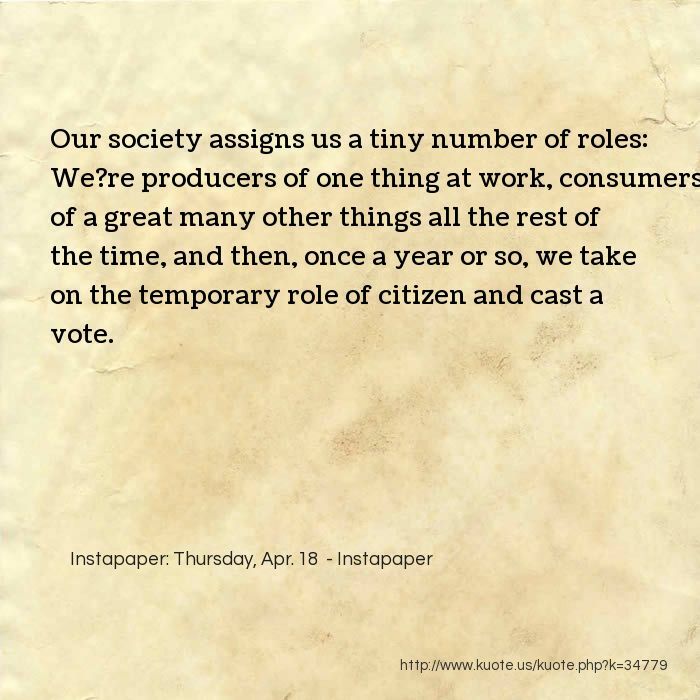 Our society assigns us a tiny number of roles: We?re producers of one thing at work, consumers of a great many other things all the rest of the time, and then, once a year or so, we take on the temporary role of citizen and cast a vote. 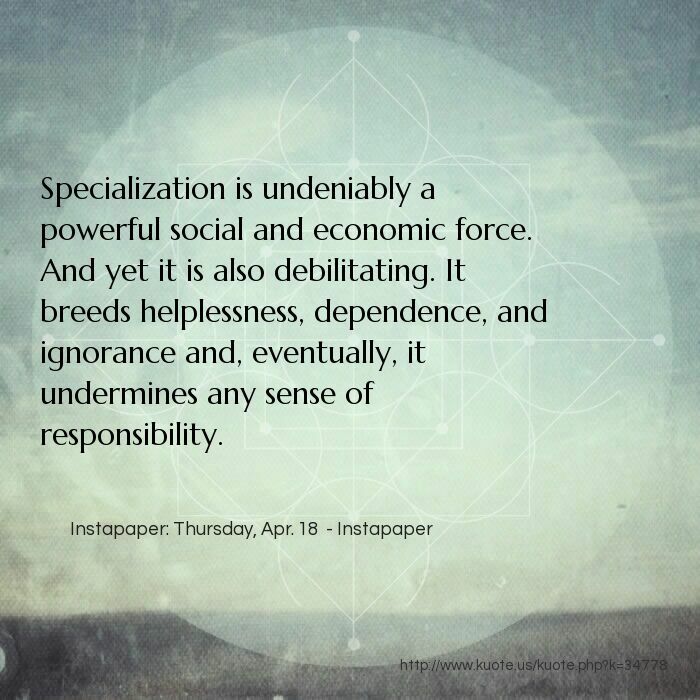 Specialization is undeniably a powerful social and economic force. And yet it is also debilitating. It breeds helplessness, dependence, and ignorance and, eventually, it undermines any sense of responsibility. Technology and social networks both require serious cash. With investment, it is possible to beat back giants. Look at the rise of Apple in 1999 when the company finally started making the right technology choices again. Look at famous disrupting forces like Napster, Redhat, Netscape, Firefox, Twitter, Ubuntu, Chrome. All of those required large amounts of cash to take their share. 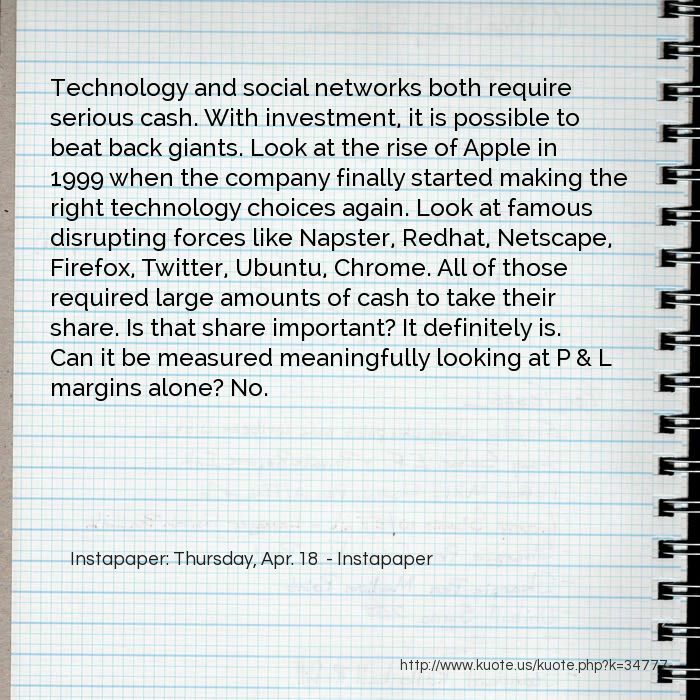 Is that share important? It definitely is. Can it be measured meaningfully looking at P & L margins alone? No. 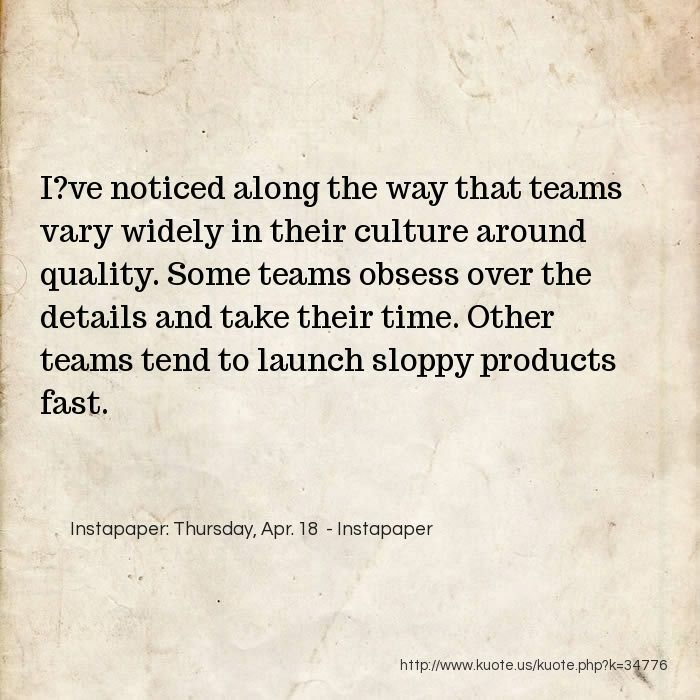 I?ve noticed along the way that teams vary widely in their culture around quality. 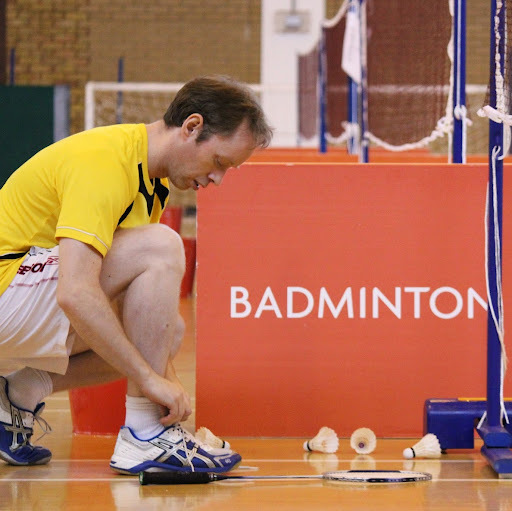 Some teams obsess over the details and take their time. Other teams tend to launch sloppy products fast. 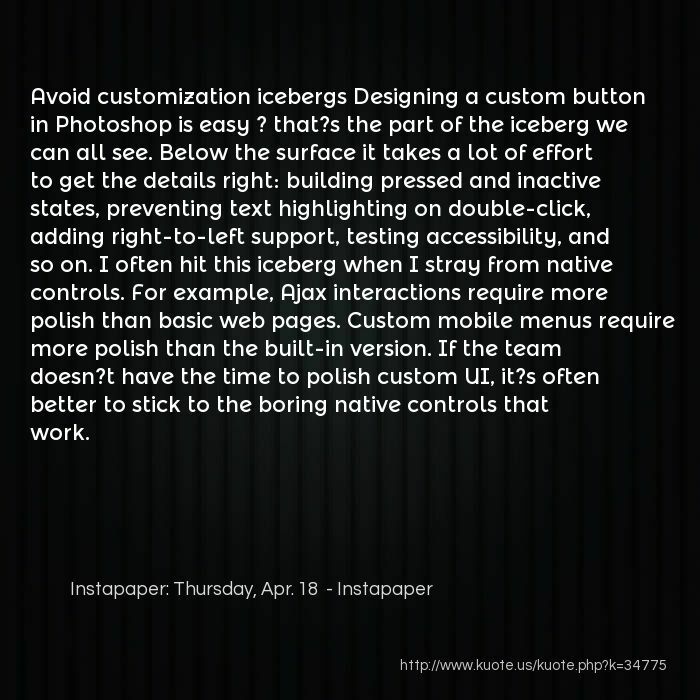 Avoid customization icebergs Designing a custom button in Photoshop is easy ? that?s the part of the iceberg we can all see. Below the surface it takes a lot of effort to get the details right: building pressed and inactive states, preventing text highlighting on double-click, adding right-to-left support, testing accessibility, and so on. I often hit this iceberg when I stray from native controls. For example, Ajax interactions require more polish than basic web pages. Custom mobile menus require more polish than the built-in version. If the team doesn?t have the time to polish custom UI, it?s often better to stick to the boring native controls that work. Polish as you go I really screwed up the first time I tried to keep quality high as we were building features. It always started fine: an engineer and I would agree to a design, I?d send him a few mockups, and the next day he?d show me the progress. 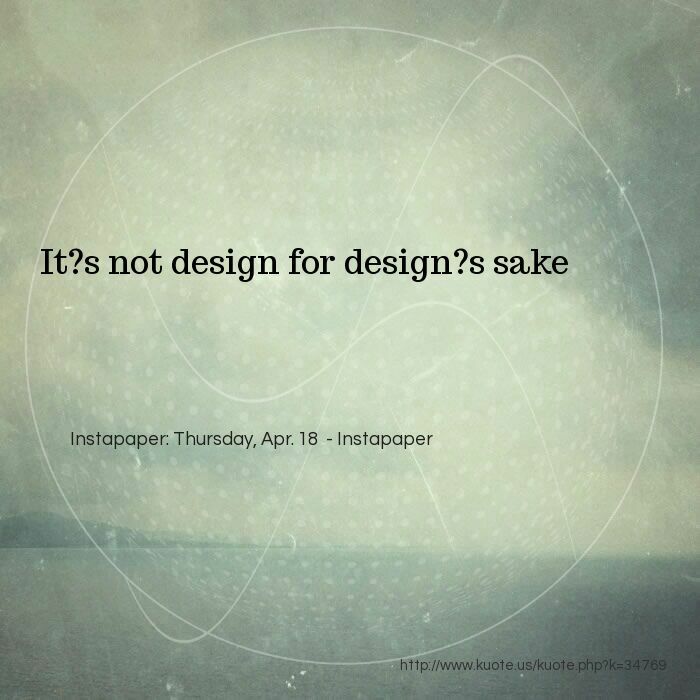 What I saw: a sloppy version of my design. Ugh. I?d moan and complain and point out all the mistakes, which wasn?t any fun. 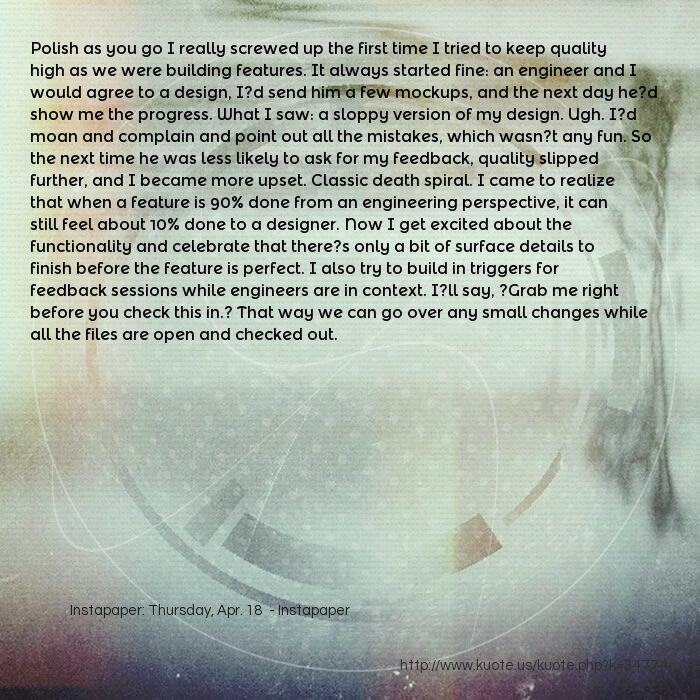 So the next time he was less likely to ask for my feedback, quality slipped further, and I became more upset. Classic death spiral. I came to realize that when a feature is 90% done from an engineering perspective, it can still feel about 10% done to a designer. Now I get excited about the functionality and celebrate that there?s only a bit of surface details to finish before the feature is perfect. I also try to build in triggers for feedback sessions while engineers are in context. I?ll say, ?Grab me right before you check this in.? That way we can go over any small changes while all the files are open and checked out. If your product needs a massive helping of fit and finish, fixing one issue won?t do much to delight you or your users. Filling one pothole won?t turn a bumpy street into a smooth one ? you?ll barely notice the change! 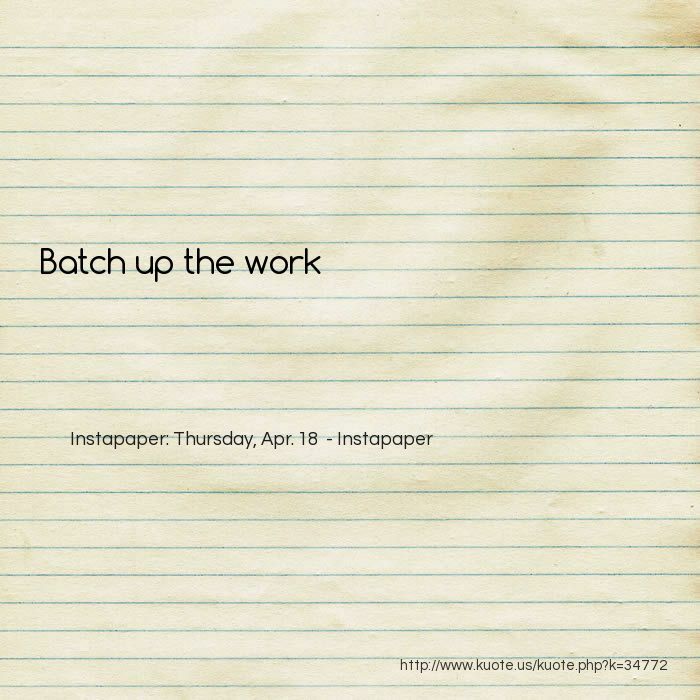 So here?s the trick: Batch up UI bugs into one sprint. 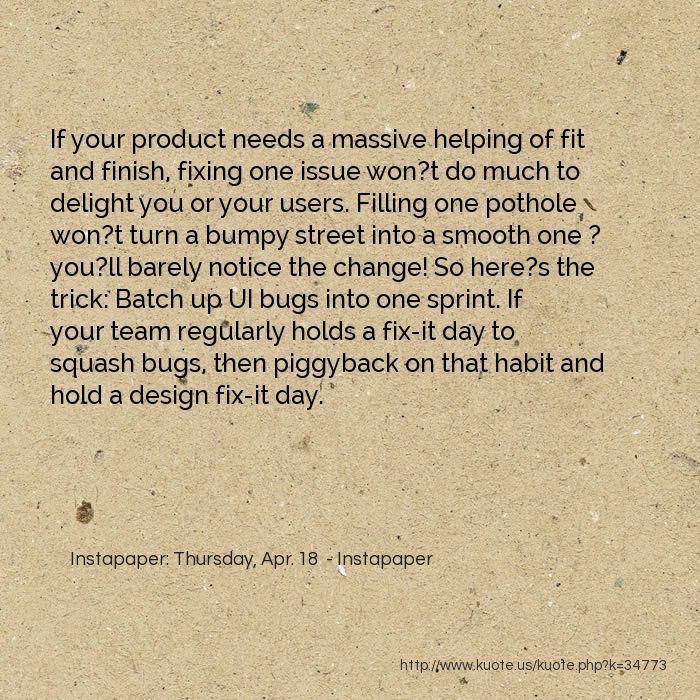 If your team regularly holds a fix-it day to squash bugs, then piggyback on that habit and hold a design fix-it day. When we?re happy, using an interface feels like play. The world looks like a puzzle, not a battle. So when we get confused, we?re more likely to explore and find other paths to success. There?s a whole book on this topic: Emotional Design by Don Norman. 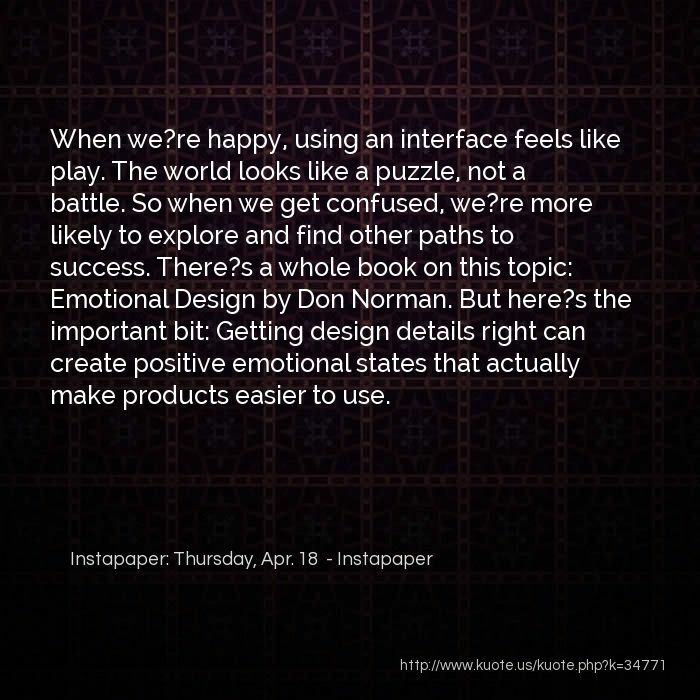 But here?s the important bit: Getting design details right can create positive emotional states that actually make products easier to use. Trust increases when we get the details right Customers judge online credibility by evaluating visual design, copywriting, and interactions. If trust matters to your business, then design details should matter too. 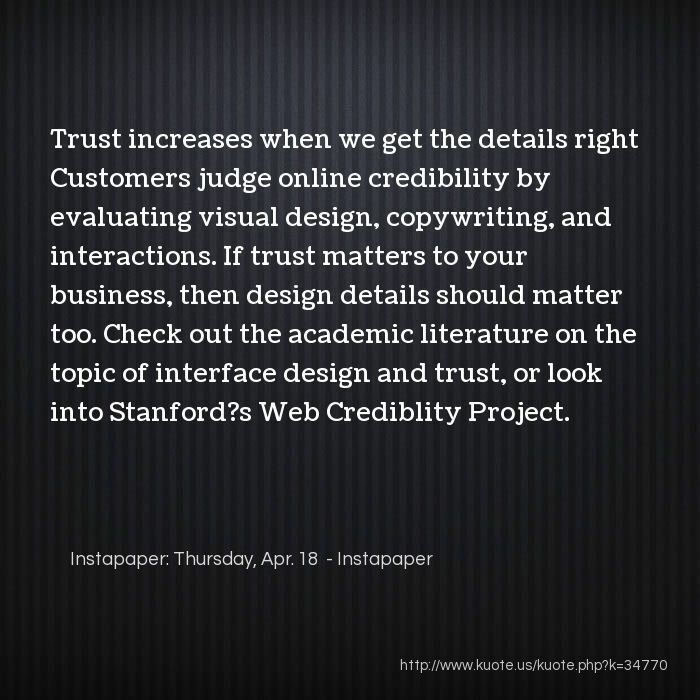 Check out the academic literature on the topic of interface design and trust, or look into Stanford?s Web Crediblity Project. 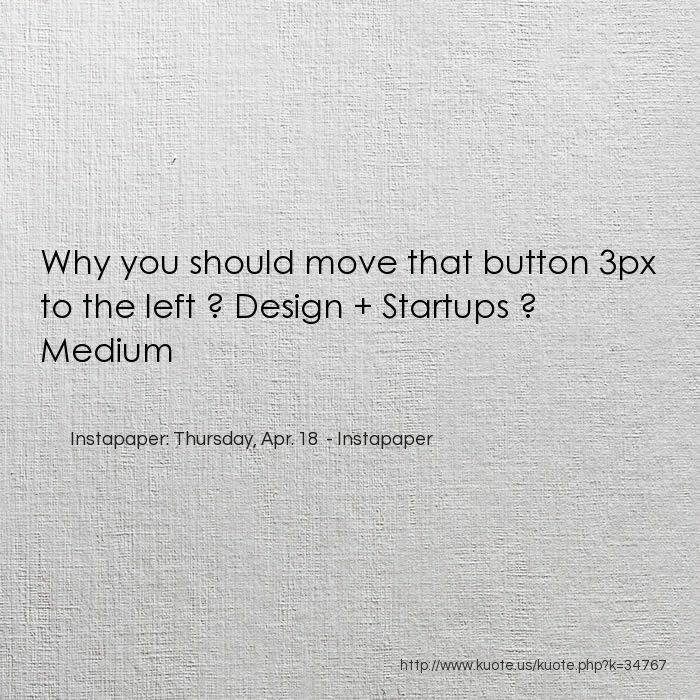 Designers notice the gap between functional and delightful, and that?s why we obsess over the little details. 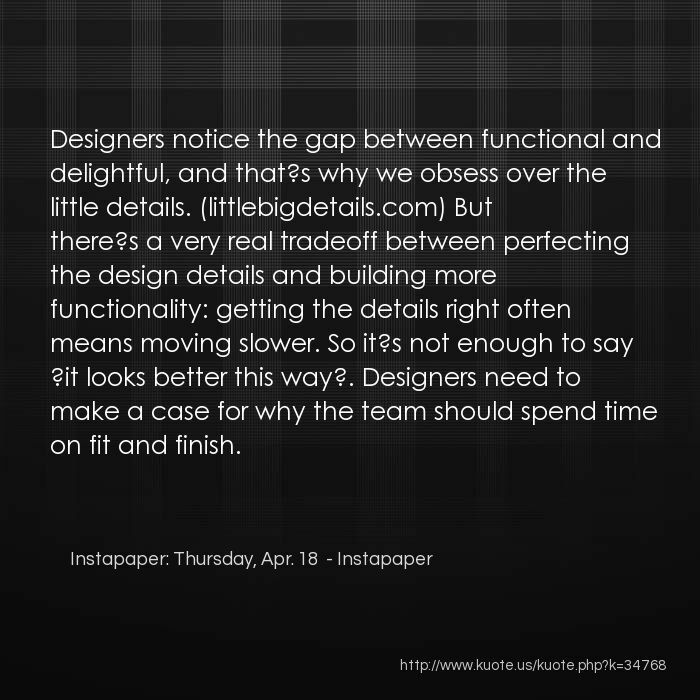 (littlebigdetails.com) But there?s a very real tradeoff between perfecting the design details and building more functionality: getting the details right often means moving slower. So it?s not enough to say ?it looks better this way?. Designers need to make a case for why the team should spend time on fit and finish. 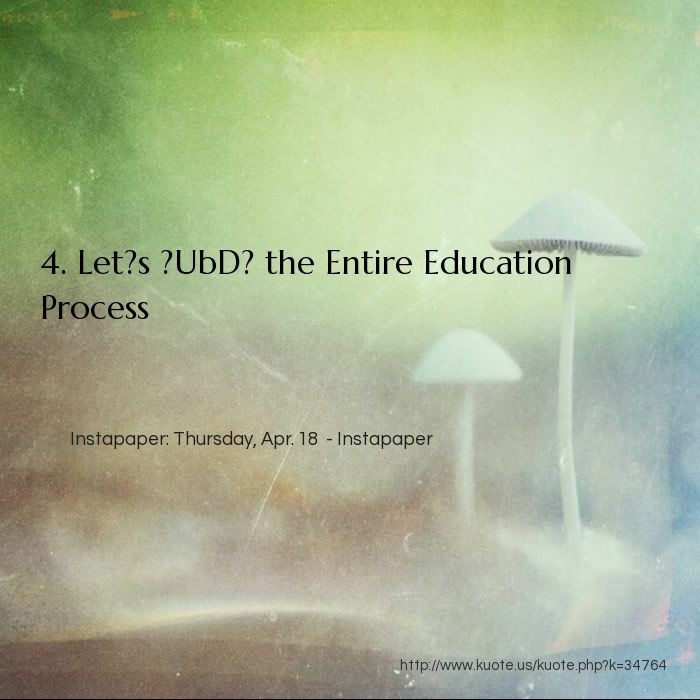 Let?s UbD the entire education system/process. We start with jobs. Real jobs that people have, and jobs that people do not have but will have in the next 5, 10, 15 years. What are the skill needed to successfully complete each job? Then we can come up with specific skill sets for each industry etc. We then move to the University level. How can we get students to master these skills before graduating? How can we assess this? How can we teach and foster these skills? Also, what skills are needed to be successful in college (undergrad and graduate school)? We then move to the high school level. How can we get students to master the skills needed in college (which colleges have identified) during high school? How can we assess this? How can we teach, model, and foster these skills? Can we break it down by grade level etc? Also, what skills are needed to be successful in high school? We move down to middle school, and then elementary, and then Pre-K. If we want to nationalize anything, this should be it. Students, parents, teachers, and school administrators will all know where they are headed and why they need to learn what they are learning. We start with jobs. Real jobs that people have, and jobs that people do not have but will have in the next 5, 10, 15 years. What are the skill needed to successfully complete each job? Then we can come up with specific skill sets for each industry etc. We then move to the University level. How can we get students to master these skills before graduating? How can we assess this? How can we teach and foster these skills? Also, what skills are needed to be successful in college (undergrad and graduate school)? We then move to the high school level. How can we get students to master the skills needed in college (which colleges have identified) during high school? How can we assess this? How can we teach, model, and foster these skills? Can we break it down by grade level etc? Also, what skills are needed to be successful in high school? We move down to middle school, and then elementary, and then Pre-K. If we want to nationalize anything, this should be it. Students, parents, teachers, and school administrators will all know where they are headed and why they need to learn what they are learning. Seriously, if grown adults are cheating for kids on standardized tests then there has got to be something wrong. If it happened just once, I?d probably blame the person. 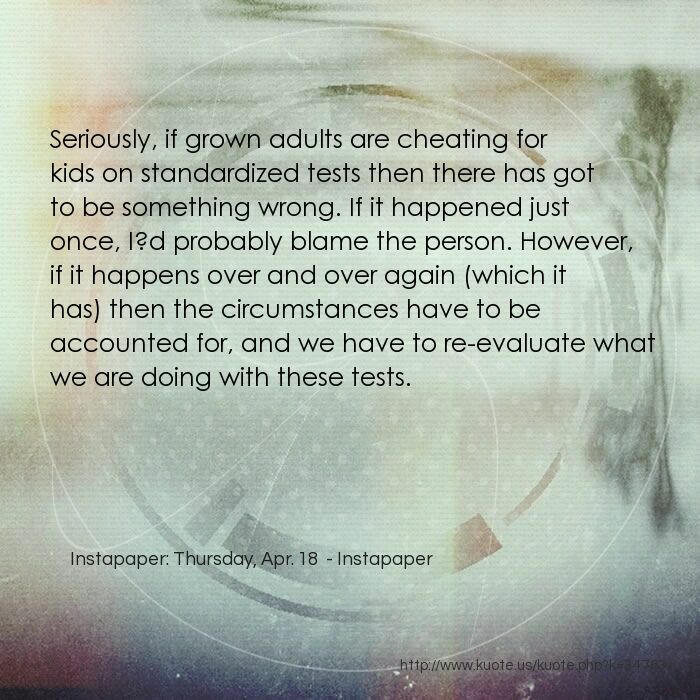 However, if it happens over and over again (which it has) then the circumstances have to be accounted for, and we have to re-evaluate what we are doing with these tests.